There are now just four weeks to get your NPA election nominations in. The closing date for nominations for the NPA Producer Group (PG) and the Allied Industry Group (AIG) is January 8. That might still be four weeks away, but with attentions soon to be diverted to the looming festive seasons, prospective candidates are urged to get their nominations in as soon as possible. So far we have had six nominations for PG, with AIG keeping its nose in front with the eight. Everything you need to know is on the dedicated voteNPA website. To nominated yourself, click here for PG and here for AIG (You will need two supporting signatures from members - a proposer and a seconder. To be validated, election addresses and head and shoulders pictures must be supplied with nominations. Full election rules can be found on the website. To see who has put themeselves forward so far, click here for PG and here for AIG. Dealing with individual farmer problems (in particular recent animal activist incursions). Dealing with a multitude of different agencies (such as Defra, AHDB Pork, Natural England, RSPCA, Animal Aid and Red Tractor). Communicating with the various media outlets and the different issues that each can bring. "This all highlights that we have a team on our side who react very quickly and promote the pig producer side of any argument. "Where would we be if we lost our export licence to China? Where would we be if regulations on welfare/environment were implemented without first being scrutinised by the NPA team who could then put across the pig sector side of the argument? "Such as it is, our industry would be in a totally different place if the issues of the day, week, or longer term were not dealt with in a professional and prompt manner. "I urge all producers to support the NPA in any way they can – whether this be joining it or standing or voting in the Producer Group election." Writing in the same issue, AIG chairman Hugh Crabtree said: “The NPA is unique as, through AIG, we also represent the supply side. “For most of the companies on the AIG, the UK pig sector is a very important customer – and a lot of topics we discuss, for example, Brexit and antibiotics, are shared issues. The bottom line is, if you have a successful group of primary producers, you have a successful group of allied traders. “The benefits of being on AIG are the same as for Producer Group - the opportunity to be involved in the thick of it, to influence policy and also enjoy a privileged position of having a lot of information, the unspun version, of what is going on in the industry. “You also get great access to NPA staff members who are all absolutely fantastic and very hard-working. “Being on AIG can bring real value to you and your company and, at this critical time, represents your chance to shape our future. 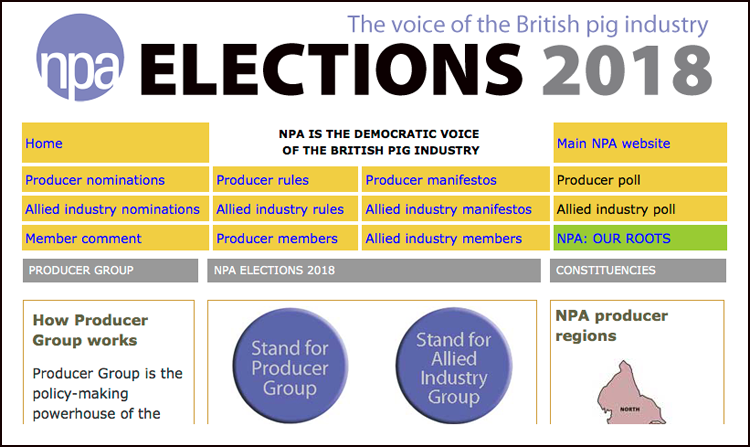 The NPA takes democratic representation of the industry very seriously indeed so we really want to get as many nominations as possible so we can have a proper competitive election."